The Lindblad Expeditions-National Geographic (LEX-NG) Fund aims to protect the last wild places in the ocean while facilitating conservation, research, education, and community development programs in the places we explore. This blog entry spotlights some of the exciting work our grantees are doing with support from the LEX-NG Fund. It often takes a hero to right a wrong. And the fishing community of El Manglito in La Paz, the capital city of Mexican state Baja California Sur, is full of heroes. For over two hundred years, the bay of La Paz and its lush carpet of oysters, clams, and scallops sustained local residents. By the mid-20th century, however, artisanal fishermen were walking a knife’s edge. Faced with increasingly difficult economic conditions, they needed to harvest enough clams and scallops to provide sufficient income for their families, but not so many that the bivalve populations dwindled to unsustainable levels. At the time, clams and scallops were harvested by free diving. Like the character Kino in John Steinbeck’s novel _The Pearl_, fishermen simply held their breath and swam to the bottom of the shallow bay to collect clams and scallops. The balance was maintained. But with the introduction of “hookah rigs,” which allowed fishermen to breathe underwater by using air lines to the surface, everything changed. A fisherman from El Manglito uses hookah diving equipment to harvest Catarina scallops from a shallow nursery for relocation deeper in the bay of La Paz. Image courtesy of Producciones Cormorán. Now fishermen could stay underwater for longer periods, allowing them to collect significantly more bivalves. 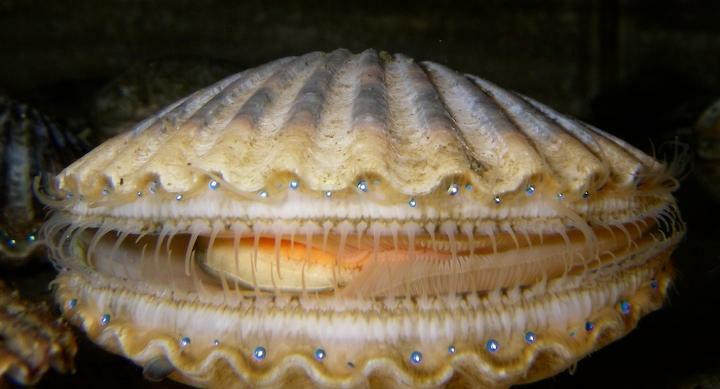 The improvement in diving technology—as well as a change in regulations that lowered the minimum age for fishing activity to 13 years old—led to the unintentional overharvesting of valuable Catarina scallops and pen shell clams. By 1978, bivalve fisheries in La Paz Bay went commercially extinct, and to this day, they haven’t recovered. Yet. Like all good stories, this one has a healthy measure of hope and the promise of a happy ending. And it’s all thanks to a determined group of local fishermen from El Manglito. Catarina scallops were over-harvested in La Paz Bay to the point of commercial extinction by the mid-20th century. Thanks to a group of dedicated locals from El Manglito, their numbers are beginning to recover. Image courtesy of Producciones Cormorán. With material support from regional nonprofit NOS Noroeste Sustentable (NOS)—and financial contributions from the Lindblad Expeditions-National Geographic Fund and the Mexican Fund for the Conservation of Nature—El Manglito fishermen have taken the lead to restore pen shell clams and Catarina scallops, the most economically valuable bivalve species, to La Paz Bay. It all started in 2009 when a group of fishermen from El Manglito began concerted efforts to improve their community. Joining together with NOS, they organized neighborhood clean-up projects, recycling programs, and after school care spaces for children. Then they tackled the undertaking that would significantly improve local economic and environmental conditions: restoring the bay. Efforts began with coastal and subaquatic clean ups. Next, the fishermen dove into bivalve aquaculture and restoration efforts that continue today. El Manglito fishermen prepare a cage used for the reintroduction of Catarina scallops to La Paz Bay. Image courtesy of Producciones Cormorán. To boost bivalve numbers, these fishermen raise juvenile clams and scallops in shallow nurseries along the shore. Once the bivalves are big enough, volunteers—El Manglito fishermen and their families—transport them to deeper areas of the bay. That doesn’t sound too hard, right? Wrong. Besides the logistics of managing millions of bivalves, they also contend with other fishermen who don’t share their vision. To protect clams and scallops from illicit harvesting—and make sure their numbers continue to rise—these everyday heroes have taken it upon themselves to patrol 2000 hectares of the bay, or nearly 8 square miles (the equivalent of 3,200 city blocks)—24 hours a day, seven days a week. That’s dedication. Once mature clams and scallops are transferred to the bay, a group of local fishermen monitor the health of the bivalves and patrol the fisheries to protect the recovering marine resource from poachers. Photo courtesy of Fondo Mexicano para la Conservación de la Naturaleza. So far, they have actively deterred poachers by reporting them to authorities, and the project has been a success. Thanks to their tireless efforts, NOS estimates that by the end of 2018 there will be 3 million Catarina scallops in the bay, up from roughly 84,000 in 2015. This will put them a quarter of their way to restoring a sustainable scallop population. The fishermen are even closer to their pen shell clam target. By 2018, their restoration efforts should double the number of pen shell clams currently in the bay to over 1,000,000—91% of their goal. Why are El Manglito fishermen working so hard to boost bivalve numbers? Because once clam and scallop populations have sufficiently recovered, they can be harvested and sold commercially once more. These bivalve fisheries will create year-round jobs for a number of local families, and because they’ll be sustainably managed by the fishermen who care so deeply about them, they can operate indefinitely. Catarina scallops in the process of being transferred to deeper areas of the bay. Image courtesy of Producciones Cormorán.